Why are onions bad for dogs? When I started cooking food for my dog Tsuki, I checked up on all of the foods that are dangerous for dogs. One of the food that you hear time and time again, is the fearsome onion. At first I just took it for granted that everyone was right, and moved on with the onionless food that I was preparing, but eventually I started to look into a little further. Yes, it turns out that onions are bad for dogs. And REALLY bad for cats. Actually, dogs, cats, horses, sheep, and monkeys all have shown adverse reactions with onions. So in that case, what is so special about humans? So what happens when dogs eat onions? They’ll appear fine immediately afterwards, but the next day they will feel sluggish, and perhaps won’t get up. Their urine will be reddish, and will smell of… onions. It could potentially be a very serious illness, if you dog has eaten enough onions. How much is enough? A LOT. In one of the studies I was looking at, researchers gave onions to dogs to find out the effects. In this study onions were the ONLY thing that the dogs ate FOR TWO DAYS. And every single one of the dogs survived. So unless your dog has gotten into a giant bag of onions, this isn’t going to be a life threatening illness. However, continually feeding your dog onions will affect them, by lowering the amount of red blood cells in their bodies. Red blood cells are the main cells in your blood that carry oxygen from your lung to the rest of your cells. The blood cells are similar for most mammals, with a few differences that I’ll talk about later. Onions cause an illness called Heinz-body anemia, which lowers the amount of red blood cells in the dog’s body, and makes it harder for your dog’s cells to receive oxygen. That’s why an affected dog won’t really move, and will breath faster, because your dog is working harder to get oxygen into the blood stream. However, if there aren’t enough blood cells to do the job, the dog is in trouble, no matter how hard she breathes. If your dog has gotten into a large amount of onions, and is having trouble getting up, you should go to a vet. She might need a blood transfusion. But afterwords, everything should be fine. The good news is that the illness goes away in a couple of days, and there are no permanent effects. Dogs replenish their blood cells continuously, and at a faster rate then humans. So any blood that is lost will be replaced within a couple of days, and your dog will be good as new. But the question still remains, what exactly is a Heinz body? Why does it cause anemia? Why are dogs affected? And what is it about onions that cause this? I’ll give you the answers next week! If my knife has touched an onion and with the same knife I cut up bananas (w/ washing it) for my dog how high will the risk be? This will be perfectly fine; nothing to worry about! 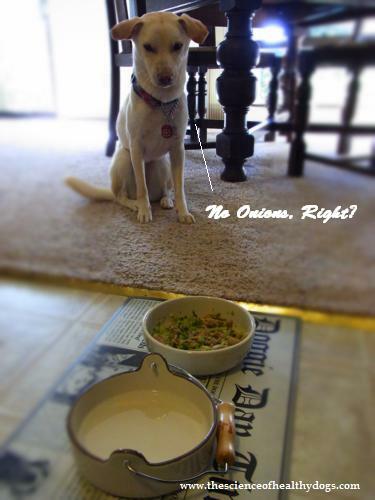 Onions are dangerous for dogs, but only at fairly high amounts. Studies on the effect of onions on the blood had dogs eating entire meals of onions, and there were no fatalities. I’m a retired person ,my dog is a lot of my social life now and we do go places when I can taker him. To think that I poisoned him with onions bothers the hell out of me..I cooked onions in a soup and gave him some of the soup not knowing it was bad for him (even in small amount) . the reason I questioned onions is I looked on a dog food bag and did not see onions I saw carrots peas and meat .I now know and will be carful of my buddies diet thank you so much for the info. Don’t worry too much about that small of an amount of onions. As I said before, there have been studies where dogs were fed full meals of onions, and none of the dogs died. So onions in soup shouldn’t be too bad. The blood cells of your dog were probably back to normal within a day. Just stay away from onions for your dog from now on!